It was close. Far too close and tense in the final 10 minutes for heart rates. But for Johnny Heaney's superb double goal-line block off Danny Kirby and Diarmuid O'Connor, and it is questionable whether Galway would have contained the Mayo charge in the last quarter. Galway led by 0-15 to 1-09 when the Killanin man showed terrific positional awareness, skill and bravery to keep the ball out of the Galway net. However, Kevin Walsh's team was finding it extremely difficult to break up the field for scoring opportunities. Against a really strong wind at that stage, they could only score two pointed frees from substitute Gary Sice in the last 30 minutes. Heaney's intervention was huge when it came. A game changer in many ways - after young Ruairí Lavelle had unnecessarily lost the ball trying to punch it to one of his defenders. 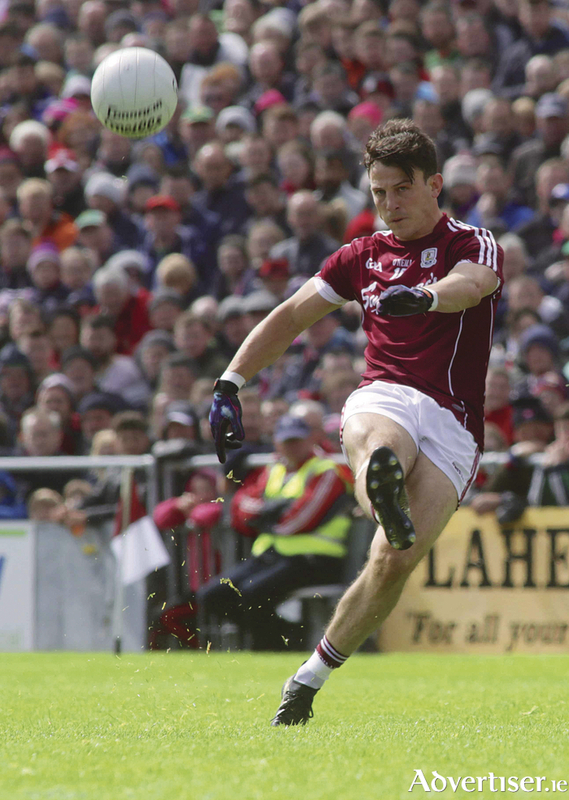 The Renvyle man had Galway supporters gulping hard on a good few occasions and he showed a lot of nerves to keep the short kick-out strategy going even when he must have been tempted to just pump it out the field. It was a tough championship game for him and he will have learned a lot from playing in such a cauldron. Galway lived dangerously in that last quarter, but they showed a lot of bravery, and plenty of hard work and belief to continue to block the Mayo forwards, and they deserved their narrow 0-15 to 1-11 victory. Damien Comer's colossal shoulder on Diarmuid O'Connor that resulted in a Galway free exemplified the passion and power Galway brought to the game when it was needed. Paul Conroy also put in one really super stop fairly, and he showed leadership to win a badly-needed free at a crucial stage in the second half. Galway started well with all first five shots leading to points - Damien Comer, Gareth Bradshaw, Séan Armstrong (free ), Michael Daly and Shane Walsh, all producing high-quality scores. A sucker goal for Mayo's Kevin McLoughlin, who reacted fastest to a rebound, was a big plus for Mayo, and it gave them a real foothold in the game. McLoughlin was one of Mayo's best players in that first half, and David Wynne found him a real handful. Thankfully Armstrong, who last played championship for Galway in August 2014, had his scoring boots on. He notched two good 45s and another free to bring his first half tally to 0-4 off placed balls. Galway led by 0-9 to 1-5 at half-time and everyone knew the second half was going to be a test of wills. Galway had an extra man for almost 50 minutes due to Keith Higgins' moment of sheer idiocy, and that was a big factor in the game. It allowed Galway to play an extra man at the back when required to support the full-back line. It also allowed Galway to create an overlap on the wings. On a few occasions team captain Gary O'Donnell got in at the back, and he should have punched a point when bearing down on David Clarke from a tight angle. Liam Silke, too, on the other side of the field, had a glorious chance for a score or at least winning a free or a penalty when he was put in the clear on an overlap, but he turned out the way, instead of driving on with the ball. Danny Cummins and Michael Lundy also both lost crucial possession at critical times when scores were on in the last few minutes. Galway will have to be more clinical when they get such chances in the big championship games that lie ahead. That said, they will have gained enormously from the win last weekend, and the confidence levels and mood at training should be top class over the coming weeks before they face either Roscommon or Leitrim on July 9. Players such as Eamonn Brannigan, who did well after coming on at half-time, will be gunning for a starting jersey in four weeks' time and he will not be alone. Young Cillian McDaid looked ready to jump over the whitewash into action a few times too, and the U21 star could have a big role to play as the season progresses. Last Sunday was a job well done and credit to the entire panel and the management team for overcoming a tough hurdle. Well done to the pitch committee at Pearse Stadium too who had the playing surface in top class shape. The work on the pitch over the winter months is bearing fruit now. It is back to the club championship for the county lads this weekend, and after that they will be fully locked in to trying to put back-to-back provincial titles together for the first time since 2002 and 2003. Interestingly, 2003 was the last time that Galway won a footballing All-Star too.